Fake Polar Bear Scare Unmasked: The Saga of a Toppled Global Warming Icon | Watts Up With That? February 27, 2017 in Climate News. Yeah, but what about the Arctic penguins? Arctic penguins were hunted to extinction in the early 1800s. They were not related to Antarctic penguins but they looked surprisingly similar and they were the first birds to be called penguins. Now that is certainly aukward now, isn’t it? Welsh whalers when they saw Great Auks called them “Pen Gwyn Fawr” , big white heads, as opposed to the local Auks common around the coast of Wales which were much smaller. Great Auks had white faces which accounts for their name. The Pen Gwyn name rapidly mutated into Pen guin and was applied to similar birds in Antarctic when sailors first visited those regions. However, they generally look the same, but do not have white heads. Auks were not, are not and apparently will not ever be penguins. It is the Antarctic “penguins” which are not now, never have been and never will be true penguins. They are spheniscids, of the Order Sphenisciformes, Family Spheniscidae and modern Genera Aptenodytes, Eudyptes, Eudyptula, Megadyptes, Pygoscelis and Spheniscus, plus a number of extinct genera. The scientific name of the great auk is Pinguinus impennis. It was a true penguin. It belongs to Family Alcidae (auks) in the Order Charadriiformes. Bring back the great auks! Kip, just wait till they are homogenised, they can be anything then! There are so few polar bears because most of them swam to the Antarctic after reading about the 150.000 trapped penguins there (h/t Chris Turney) which looked like “Gefundenes Fressen” as the Germans say; easy pickings. After the Great Penguin Eating most of the polar bears died from over-eating and / or overheating because of the rapidly warming Antarctic. That’s why there are so few polar bears & penguins. They should have stopped swimming when they reached Sable Island. If there is a place in need of polar bears this is it. 400 estimated seal pups birthed in 1963 which has increased to 62,054 in 2010. I figured it was probably something like that. interesting post sc,and some people wonder why certain cod populations are increasing slower than others. an extra 62 k every year seals may have something to do with it. marine biologists also ignore that some of the huge populations of cod in the past could well have been a result of high levels of predation on seals by man. Excellent video with a lot of good data. Would like to have seen a two or three paragraph synopsis with a few charts, thought, for us ADD readers. 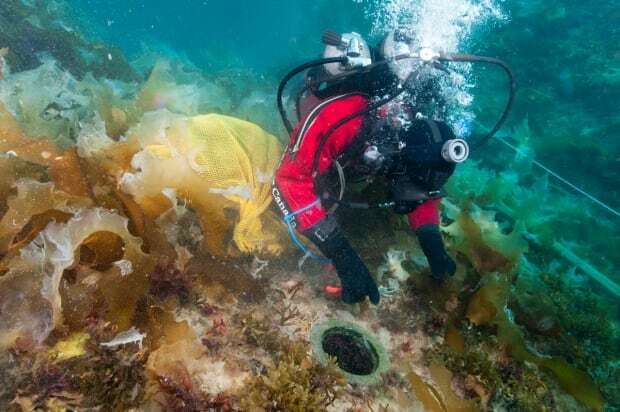 In the picture above they are actually clearing the KELP off the wreck of Franklin’s ship the HMS Erebus. Arctic waters are very nutrient rich and sunlight poor. Less sea ice means a more robust food chain where plankton feeds shellfish which feed seals which feeds polar bears. The 100% ice cover during summer and winter that the Global Warmists pray for would instead result in the extinction of pretty much everything. You won’t read that anywhere. Good news for the Polar bears. Another climate warming scare bites the dust. So global warming will kill seals? God I have to get some abstracts together for funding……. If people bother to spend time researching known Polar Bear eating habits, the idea that low sea ice levels being a threat to the Bears, would lose steam. There has been lots of work on polar bear feeding habits. I have known some of the people studying polar bears and they are wonderful people and competent researchers. They can tell you things about polar bears that you never thought to ask. When faced with the question of what happened to polar bears during the Medieval Warm Period (MWP), the best the researchers can do is to deny that it happened. Everyone, no matter how competent, can suffer from cognitive biases and blind spots. Experts tend to believe other experts. When a Nobel Prize* winning expert like Dr. Michael Mann tells them that the MWP didn’t exist, they will believe him. Thus, they don’t have to worry about what did happen during the MWP when there was less summer sea ice. If they faced that question they would save themselves embarrassment. what about the Holocene optimum when the arctic was pretty much ice free for 4 thousand years? why didn’t the polar bears go extinct then? I think they float, too, often. Trouble is, the average Dude on the Train doesn’t spend time “researching” (or indeed, reading) anything, they just believe whatever the “news” feed on Facebook or whatever tells them. The “cat ladies” believe anything the WWF or Greenpeace magazines say (Send us money or these animals will DIE!) It would be hilarious if it weren’t so pathetic. When I say “carbon” is not a problem in need of solving, most “nice” people still look at me like I’ve got three heads. Is it possible to ever recover from fake polar bear news if the official all clear signal is not given by Facebook and HuffPo? This will be a good test of media power? A most interesting article and video. Hmmm … let’s hope for the extinction of … greenpiss. Enjoyed your new book on polar bears, also. Highly recommended to all here. Thanks! However, not everyone is a reader and this video may reach an audience that a science-based thriller of a novel or a non-fiction book will not. That said, there is something about a solid volume you can hold in your hand, pull off the shelf to share with others, lend to your friends and relatives, or look up a reference. Sometimes, you need the easy-to-read format with all the references. “Polar Bears: Outstanding Survivors of Climate Change” has that, along with a 2 page, bullet-point summary and short (2 page) conclusions. And need I point out that the royalties do help a little to offset all the time I put into trying to keep this field from being swamped by hype. An excellent video. Unfortunately you’ll never get a corrupt organisation like Greenpeace to change its ways. There are too many high salaries at stake and too many useful idiots to keep on side. The point is not to get Greenpeace (or WWF, or Polar Bears International) to change their ways. The aim is to inform those who simply have not heard that polar bear numbers are up, even though the summer sea ice in 2007 reached what the experts said would be devastating levels – and stayed there. Since 2007, polar bears have been living through their dire sea ice future but they thrived. Model busted, assumptions busted, confidence in polar bear experts busted. Time to re-examine the ESA listing with an independent team from a range of disciplines, based on the models and predictions that got them put on the list in the first place. I agree with you entirely, but how do you get the information out to the general public? The MSM won’t give this any coverage. The so-called BBC will ignore it and continue to tell the public that the Arctic will soon be ice-free and the polar bears will then be gone. The GWPF has an outstanding list of expert advisers and trustees and produces some excellent articles and videos, but none of its output reaches the general public. t got so much attention, in fact, that the UK’s rapid response team at Carbon Brief was called into action. So the word does get out eventually; its just hard to know what exactly will attract their attention. And FYI, nothing to do with the above, but here in Victoria it has been **snowing like crazy** for more than an hour. Environment Canada says to expect 2 cm at the airport: the record greatest snowfall for 27 February (1941-2013) was 3.0 cm in 1976. At this rate, we may beat the record. Last year, it was truly spring in late January. Go figure. The expression “draining the swamp” comes to mind. As it does for many areas of climate “science”. I’m a little south and east of you on Whidbey island (assuming you mean Victoria, BC), and an inch (2.5cm) is nothing. Maybe you meant 20cm? Susan, Having lived in Victoria during that 1976 winter I suggest you stay of the roads until it is melted. No one there has a clue how to drive on a snowflake for pete’ sake ( I worked on ski hills for 3 years and lived in Victoria for one year and fled back the the OK Valley as soon as I could! ( The constant wind was another factor but it is a beautiful city none the less). One simple way to get the news out is to share the video url on your personal Facebook account and on other available online media. Thank you for keeping it real Dr Crockford. Some theories die hard even with mounting proof against them when politics take precedence over science. We still have useful idiots parading around in polar bear suits to decry CAGW and they aren’t being questioned. It’s how the kale-gulping Earnestly Concerned social climbers virtue-signal their “arrival” at Upper Middle Middling–the Prius with the Snowflake U. sticker in the back window, right next to the WWF sticker and the one that says “Coexist” in symbols. Yet the false meme will live on for years in the age of social media edgeacation. Are they turning away donations for this fake news at WWF etc.? It will be difficult for the green blob to give up their major sources of donations: the three “P’s” – polar bears, penguins and pandas. It has worked for decades. What about whales? I remember “save the whales” was the warcry of every greenie, back in the early 80’s at least. It has made some brief resurgences which have piqued public interest, but mostly I think that it was the fun of watching million-dollar, carbon-fibre, greenie-boats getting pulverised by steel, Japanese, whaling ships. Everyone likes a little carnage. Unfortunately, due to Trump Derangement Syndrome, the Left are getting carpal tunnel writing checks to the Green Blob dot-orgs. right now. The ones with money, that is, that aren’t pajama boys and trigglypuffs living in Mummy’s basement. Griff only cares about the ice, not the people or animals that live there! He pulled a Crockford, for Jim Rockford beating a hasty 180 degree retreat. Well, almost funny. Meanwhile Antarctic sea ice at a record low and Arctic sea ice at record low for this time of year. Not been much mention of that here. Because as of today, neither of your ‘record’ assertions is true. The polar bears are sleeping now, y’see. And please watch the video, then you’ll learn that most seal hunting is in spring / early summer, not at the time of minimum sea ice in early September. It does depend on what data set you are looking at, so it helps to be specific. I posted a tweet earlier this morning showing that NSIDC’s interactive graph is showing 2017 and 2006 on 26 Feb (latest available) are pretty much the same. Polar bear number did not decline due to sea ice changes in 2006. A little less ice than average at this time of year has no effect on polar bear health or survival. However, too much thick ice close to shore can be devastating – as it was in the Southern Beaufort the springs of 1974-1976 and again in 2004-2006, when the population size dropped by about 50%. Too much at this time of year at the local level (too thick, too compacted with few open leads) is a problem because it reduces breathing area for ringed and bearded seals – so they go off somewhere else to have their pups and leave polar bears with little to eat. This phenomenon is well-documented in the literature and I’ve written about it often. Thank you Dr. Crockford – In comments under several earlier WUWT articles, I’ve alluded to the idea that since ice does not support photosynthesis, Polar Bears must find their food sources at the edge of the ice. Since Polar Bears have been exhaling CO2 over the winter months, they’ve lost body mass and need to replenish this lost carbon. Ice does not support a source for this carbon. Bears leverage the extraction of carbon from atmospheric CO2 by phytoplankton which then is consumed up the food chain to the seals. Carbon Dioxide is the base of the Polar Bear’s food chain (same for all carbon based life forms). More CO2 helps Polar Bears. All of the carbon in all Polar Bears was extracted from atmospheric Carbon Dioxide. I watched the live webcam from Churchill, MB this morning, and saw an adult and a cub walking around and eating. Antarctic sea ice hardly exists. Arctic sea ice is almost solely a function of winds. The earth turns beneath the ice and bumps it along out between Greenland and Europe, and Greenland/Newfoundland. Good winds mean there is very little ice. Everything but seals do better then. Bears do much better because there’s nowhere for seals to hide. There were multiple instances of people bringing submarines to the surface right under the North Pole in the late 50s early 60s. You’ve only been studying the arctic 20 years. I’ve been studying it 50. You simply don’t have the first clue about what a healthy arctic ecosystem looks like. Here’s a hint: warm. Yeah that’s why this is considered an AVERAGE optimum period in earth history. There’s nothing unusual about either poles’ ice conditions. I have seen the pictures of subs surfacing in late winter at the North Pole from 50 years ago. Did the heat rejected from the subs condensing steam help melt the ice? It really is sad the way the trolls can’t tell the difference between weather and climate. There’s always a big loss of ice after an El Nino. I call BS? Reference please. Be a big boy and do your own research Simon, instead of demanding it from the grownups (and then ignoring it). Ha ha, what a joke? I’m not the one making the fictional claim. There have been whole posts on recent sea ice here. You ought to read the blog before making such blatantly erroneous assertions. WWF Norway still runs its “Polar Bear Godfather” campaign, where you can “save the polar bears” with a small donation…No, don’t send seal meat. Thank you Dr. Crockford. Our whole family enjoyed your latest book!! Highly recommended reading for all who find the Polar Bear a fascinating creature!! Thanks David! Much appreciated feedback. Polar bears do well when there’s no ice because the seals are forced to stay near shore and it’s a slaughter. More ice = better for seals = not as good for bears. 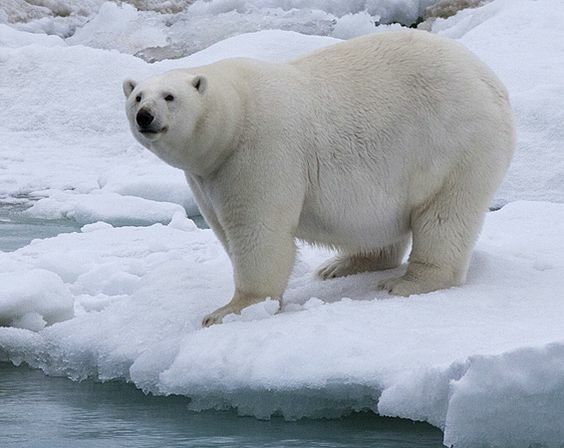 Ice can multiply many times, the amount of space a bear has to cover to hunt the same seal. Seals must sleep. When they can spread out along the ice for miles and miles it’s INFINITELY harder to find them easily. On the other hand when there’s nothing but a gravel bar to park on – not so much. A statement like that may seem logical to you but I’ve seen nothing at all in the extensive literature on seals or polar bears to indicate that it is true. Ringed seals especially do well with less ice because they do most of their feeding for the year during the open-water period: a longer ice-free period means they can feed longer and pack on more fat for the coming winter and more females are able to produce healthy pups the following spring. More seal pups in spring = more food on the ice for polar bears. Bearded and ringed seals give birth onshore in the Sea of Okhotsk but there are no polar bears there and as far as we know, there never has been. The seals that spend time on the ice during the summer are primarily adult bearded and harp seals. Those adult seals know to watch out for bears and also, the broken ice affords them many escape route. So a bear may stalk seals in summer but they are not likely to be successful very often. Some bears, of course, may learn how to do this well with a few practiced techniques but in general, most bears out on the ice during the summer eat few seals. i love your work dr crockford . clear concise and to the point, you have that knack of being able to explain things in easy to understand terms to the layman without losing the important detail of the topic. keep up the good work. I guess those seals are smarter than we give them credit for. Dr I don’t know what you are trying to say. You basically repeated what I said. When there’s less ice, it makes polar bears’ main food healthier and more well fed, therefore more plentiful,in the first place. With less surface area to haul out on and have young. It doesn’t get any simpler. and fewer places to hide. Particularly for the young which are legendarily unable to defend themselves, life without a lot of ice is short and ends violently with bears simply killing the young, eating the fat, and leaving the rest, as a way of life. When there are many ring seals on a small amount of ice the slaughter is substantial. The problem is getting the facts in front of people. As mentioned up thread the BBC wouldn’t touch facts like those Dr. Crockford presents here with a disinfected bargepole. I wonder if we can get Chris Booker at The Telegraph do do a piece on this and at least mock the BBC for their failure to report the facts if not shame them into some actual journalism for a change? 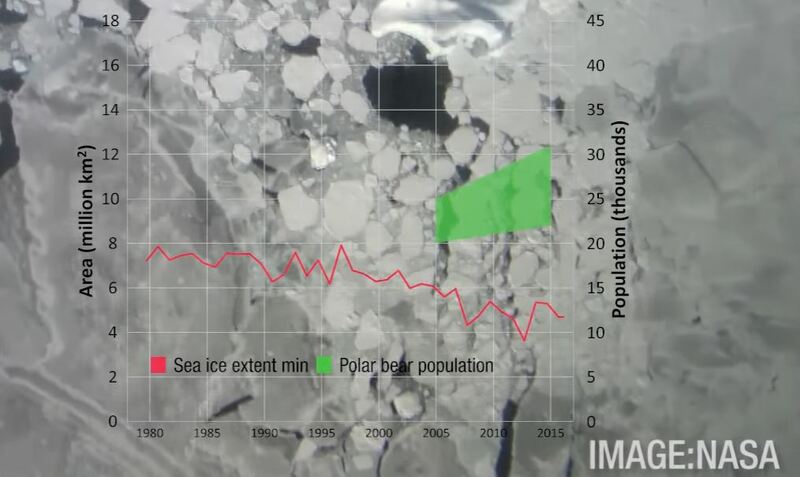 As Paul Homewood has posted the video at https://notalotofpeopleknowthat.wordpress.com/2017/02/27/as-polar-bear-numbers-continue-to-increase-gwpf-calls-for-re-assessment-of-endangered-species-status/#comments, there is a good chance that Christopher Booker will pick up on it. Griff, we’re waiting to see if you attempt another kneecapping of Dr Crockford. And we’ve noticed you’ve recently added Dr Curry to your list of hits. Of course, since you post anonymously, we really have no idea about your qualifications (I mean other than you’re a weak troll). I know this is a personal question, but do you ever pick on anybody but women? Ooooh ! That’s gotta hurt !! I bet this hurts even more !! I post anonymously for several reasons but I am happy to state that I am a Master Mariner Foreign Going with 5 years command time and then 22 years as an estuary Pilot. So how about it, Griff? Griff, like Tony McCleod, does not have the testicular fortitude to debate with the good Dr. Crockford because he, and everyone else who has witnessed these two in recent month fail time again, any challenge to Dr. Crockford’s qualifications, abilities, knowledge and experience on the subject will be severely dealt a blow. Perhaps the hypothesis that life adapts should be explored? Not every species is a special snowflake but those with a belief in CAGW are most definitely of that class. How do mother-bears manage to den down over winter and nourish their cubs before and after birth adequately? Are the cubs a hindrance in the happy times of seal hunting in the spring? They lay on so much fat in spring, summer and fall that a human would die of lipid poisoning. Why the bears don’t is an area of physiological study. They do die–at about 18 years! Would be dangerously morbidly obese if human. Hindrance or no, the cubs need to learn how to hunt from mama bear, and the spring hunt is the best time for schoolin’. Any Greenie over-concerned with polar bears should go try petting one. Samoyed on steroids? At least that’s what he thought … until …. I would have guessed polar bears rarely attack humans because most polar bears never see a human. However, I strongly concur greenies should test this polar bear behavior. Yep, That’s the money quote right there – ‘satiated’. Polar bears are the only true predators of the bruin clan and will quite readily hunt humans, even if they’ve never encountered them before. But if they’re ‘satiated’ – as in ‘full’ – there’s no need. I understand that Polar bears evolved in the UK and the most recent skull was about twelve thousand years old. Might be of interest. or otherwise killed by the most dangerous predator on earth …us . 1. The ice that matters to polies is landfast ice in the spring, on which mama ringed seals build their snow lairs in which to give birth to their pups and keep open their holes into the water below. Drift ice in the summer, not so much. 2. Mama polies emerge from their winter dens with their cubs (technically the estivate rather than hibernate, a distinction with very little difference) in the spring. They are hungry and need seal pups to eat. 3. Male polies spend the winter roaming the arctic wastes, eating whatever they can find, whether on land or ice. Ditto the summer, although more land and less ice. Cute baby ringed seal = fat-rich power bar. The polie’s sense of smell is uncanny. She can scent a seal den a mile away. Until the advent of the high-powered rifle, polies were arguably the top Arctic predator, followed by griz and humans tied for third with wolves. 4. Polar bear ranges are large, but one fit and active male polie could probably cover several sows, so loss of young males has little effect on polie populations. Today – feral hog crisis in Texas. Future – bear crises in multiple locales. Trump’s getting the feral hogs OUT of Washington . . . Here is another counterintuitive climate science theory. When the arctic ice all melts, seals will have to come ashore and polar bears will have a linear hunting ground instead of a two dimensional one. We may have to go out in the spring and club baby polar bears to death to save the seals. I have had redwinged blackbirds and common grackles and brownheaded cowbirds on my front steps since Friday, Feb. 24. 2017. Third year in a row they’re coming back early and looking for food. I have pictures. What else do you need to show that the angle of the sun is changing just slightly? Because that’s what they go by, not by ‘averages’ or ‘computer models’. Oh, sorry – I forgot that direct observation in a world of computer modeling doesn’t count for squat. My bad. Ten lashes with a limp strand of spaghetti. My pal Chuck Darwin has a reason for that. For several years we had male bluebirds winter over at our home near Foxboro, MA. Called MA Audubon and asked them WTF that was about. Males pick and or create nesting sites, and females fall for the ones who have the best sites. Sometimes males will head north early to get a good site. Occasionally some will take a big gamble and winter over. We always kept our bird feeders full. That probably defined a good site area, and lessens their risk. We had three or four red robins here two weeks ago. They’re still OK, but it was 72 degrees here on Sunday. Or some people might ask, “What about those starving polar bear sightings or those drowning polar bears?”, … to which I might answer, “What about all the starving human beings and drowning human beings? — these tragic things happen even amidst a population explosion, and focusing a camera on them does NOT mean that the starvings and the drownings overwhelm the population – it just means that somebody chooses to focus on THESE emotional events rather than the emotional events of births. If you are looking for starving or drowning polar bears, then you will find them, since you are not spending your time looking for new born bears or healthy bears. It’s an issue of observer focus, NOT an issue of dominant trends. People wanting to depict a tragic scenario will choose tragic images, at the expense of overlooking the greater picture. Thanks asybot for posting that. I was scrolling down to see if anyone had mentioned that particular misinformed article, before I mentioned it myself. What a crock of cr@p! I read that article, plus an interview which is mentioned on the same page, and was appalled that in almost every paragraph the term “climate change” was referenced! But what about the Spotted Owl….I can’t write any more….I’m too upset! The Hudson Bay population – where bears need to wait for winter ice formation, which is later in recent years. You can look up the Polar Bear International reports chronicling the impacts here. The Svalbard population, where late arriving sea ice means that bears cannot reach traditional denning areas in recent years. There are also reports of bears in poor condition and eating unusual food sources. The Beaufort Sea population, where rapid and deep retreat of sea ice means some bears have elected to remain on shore, tied to whale carcasses left by native hunters. Most of the rest of the populations are little studied and we have only vague ideas of how many bears there are. The polar bear is uniquely tied to the sea ice and the seals that need it to breed. There’s no way, sadly, they are OK and I thing it even sadder that people seem to want to prove otherwise for political, not scientific ends. This is not a report by a polar bear expert or anyone who really cares about the future of the arctic. What are your qualifications Griff? As your betters have repeatedly told you, polar bears aren’t tied to drift ice. Sow bears rely on ringed seal lairs on landfast ice in the spring. That’s it. The rest of the year they, like boar bears, hunt equally well on land or sea. Why do you refuse to learn from the world’s leading polar bear expert, Dr. Susan J. Crockford? Polar Bears International is an advocacy organization: like WWF or Greenpeace, the “information” they provide is that which supports their cause. It is filtered information that tells the story they want to tell – it’s not data. For the data, one needs to read the literature. Your so-called “Hudson Bay population” is comprised of three subpopulations, all of which are currently stable. Numbers in Foxe Basin at 2009 were an increase over the previous count and are now considered stable, despite less ice in summer than in the 1980s. Numbers in Southern Hudson Bay – the most southerly subpopulation in the world – has been stable since the 1980s despite spending longer onshore in summer than they did in the 1980s. Numbers in Western Hudson Bay (which included Churchill bears) – which is probably what you are calling the “Hudson Bay population” have been stable since 2004. Furthermore, breakup and freezeup for WHB have been stable in recent years. Breakup and freezeup are always highly variable but the shift to about 3 weeks longer for the onshore period happened back in the early 2000s and has not changed since. I’ve checked the actual literature that reports this data, which is what any competent scientist has to do. As I said in the video, Svalbard bear numbers increased 42% between 2004 and 2015, despite the poor ice conditions. I don’t question the lack of ice around Svalbard and lack of denning there – but Norwegian scholars acknowledge that Franz Josef Land to the east (in Russia) is a viable denning alternative for Svalbard females in poor ice years and the increase in numbers was actually expected (I can give you the references if you like). As for Beaufort Sea bears, the last population count (conducted 2001-2010) included a period of known decline due to thick spring ice (2004-2006) which is documented in the literature. Any decline in numbers cannot legitimately be blamed on reduced summer sea ice *even if summer sea ice was reduced* – that’s a correlation, not a causation. All those Beaufort Sea bears you say are “tied to whale carcasses left by native hunters” are fat and healthy bears, judging from the pictures in recent years. Last summer, a fat sow with a litter of fat triplets was photographed: as triplets are very rarely seen outside Western Hudson Bay, some of these bears are clearly doing very well despite spending a few weeks more time onshore over the summer. In fact, the Chukchi Sea has had a larger decline in summer sea ice than Beaufort Sea bears, but recent studies show those bears have not suffered any impact to their reproductive or survival potential due to spending a month or so longer onshore and are in better shape than they were in the 1980s when there was more summer ice. Read the papers, Griff! Press releases are not peer reviewed. Sea ice conditions in spring – when polar bears do most of their feeding – has not changed much at all, allowing the bears to get as fat as they need to be to survive through the rest of the year. Even sea ice ‘experts’ don’t expect these spring conditions to change much over the next 35 years – that’s why the focus of all this PBI angst is over summer sea ice. Despite your lame regurgitation of PBI talking points and attempts to discount my qualifications, the data from recently studied subpopulations around the world support the conclusion that polar bears are thriving despite the dramatic loss of summer sea ice. *Any* unbiased scientist with more than 40 years of experience doing this kind of analysis on a variety of species could only conclude that summer sea ice is not essential habitat for polar bears and at present, polar bears are doing well and not threatened with extinction. Griff has not learned what Polar Bears International is. Are they the ones who banned a real scientist from a conference several year ago because he was going to give facts? Well said. Unfortunately Dr. you didn’t source your information and data from The Guardian, like Griff does, so your expert analysis of the situation is very wrong. Do I need a /sarc off? Griff? Griff? [crickets] Where’d you go? Again, the Grifter simply repeats the same propaganda that has just been debunked. Goebbles methodology is not complex – he just doesn’t have another button. And his phony maudlin sentiments are the sort of thing that promotes projectile vomiting. Specialist Group in June 2001. Uncertain trends are denoted by *. These papers usually divide the Arctic into about twenty to twenty-two population groups (the Arctic is not just one, monolithic climatic zone). This paper has twenty populations and most were steady or unknown. Two populations were decreasing and two were increasing. I found that the temperature changes in these zones were interesting too. Those with steady bear populations had steady temperatures. Those two regions with decreasing bear population had decreasing temperatures, And the two regions where the bear populations were increasing had increasing temperatures. It was the opposite of what the alarmists were saying. The real problem with decreasing bear populations had more to do with over hunting than anything to do with global warming. It’s too bad that polar bears get all the press. There are bear species that are really endangered, and you’d think environmentalist would focus on them. Over the coming days a curiously revealing event will be taking place in Copenhagen. Top of the agenda at a meeting of the Polar Bear Specialist Group, set up under the International Union for the Conservation of Nature/Species Survival Commission, will be the need to produce a suitably scary report on how polar bears are being threatened with extinction by man-made global warming. This is one of a steady drizzle of events planned to stoke up alarm in the run-up to the UN’s major conference on climate change in Copenhagen next December. But one of the world’s leading experts on polar bears has been told to stay away from this week’s meeting, specifically because his views on global warming do not accord with the views of the rest of the group. Dr Mitchell Taylor has been researching into the status and management of polar bears in Canada and around the Arctic Circle for 30 years, as both an academic and a government employee. More than once since 2006 he has made headlines by insisting that polar bear numbers, far from decreasing, are much higher than they were 30 years ago. Of the 19 different bear populations, almost all are increasing or at optimum levels, only two have for local reasons modestly declined. [Version 2, published 28 February, incorporates additional reviewer comments and suggestions received on Version 1 (published 19 January), as well as new data from Baffin Bay, Kane Basin, and Barents Sea. Here is another great video, but full length documentary.